Unused 233 square foot heat exchanger, 304 stainless steel U-Bundle, manufactured by Doyle & Roth, NB. 17868, steel shell FV75PSI @ 350F, 304 stainless steel tubes 75PSI, tubes 3/4" dia. Heat exchanger is 14" dia. 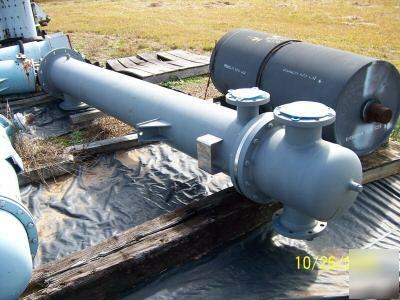 x 108" long, inlet head is steel, open flange on U-Bundle end.